During a historic vote the United Methodists of North Alabama voted to realign the number of districts within the bounds of the conference from the current 12 to eight new districts. Bishop William H. Willimon presided over the special session of the North Alabama Conference of the United Methodist Church which was held on Saturday, January 28, 2006, from 10 am to Noon at ClearBranch United Methodist Church in Trussville, Alabama. The sole purpose of the meeting was to vote on a proposal from the District Study Team, which made the proposal to reduce the number of districts. As the meeting was called to order, Bishop Willimon shared a devotion. He told the almost 1700 people gathered, We are called to follow Jesus. He is ever on the move. It takes courage to walk with him. Following the devotion Barbara Harper, chair of the District Study Team, formally presented the team's proposal and encouraged the Conference to consider the proposal saying she personally felt this move will help us move away from Administration to Ministry. When the floor was opened for discussion most of the comments were questions for clarification about the implementation of this new district structure. Following the discussion a vote was taken by a show of hands. The proposal passed by a large majority. The conference then voted on a transition team, which will include representatives from each of the current districts. The Transition Team's role will be to assist the Bishop and the District Superintendents in their role of drawing the new lines of the districts. According to United Methodist procedure, it is the responsibility of the annual conference membership to determine the number of districts and it is the bishop's duty as the presiding officer of the annual conference, after consultation with the district superintendents (the Cabinet), to form the districts according to the number established by the annual conference. [Paragraph 415 in The Book of Discipline of The United Methodist Church 2004 (the book of law and procedure of the church)]. The next step in the process will be meetings in each district for the Transition Team to hear comments and thoughts from members of local churches.These sessions are listed in the column to the left. Bishop William H. Willimon, presiding bishop of the Birmingham Area, has called for a special session of the North Alabama Conference of the United Methodist Church to be held on Saturday, January 28, 2006 from 10 am to Noon at ClearBranch United Methodist Church in Trussville, Alabama, for the purpose of determining the number of districts within the bounds of the annual conference. At present, a proposal from the District Study Team, chaired by Reverend Barbara Harper, is anticipated that will recommend 8 districts instead of the current 12 districts. Per Paragraph 415 in The Book of Discipline of The United Methodist Church 2004, it is the responsibility of the annual conference to determine the number of districts and it is the bishops duty as the presiding officer of the annual conference, after consultation with the district superintendents, to form the districts according to the number established by the annual conference. Throughout December the North Alabama Annual Conference will be publishing and distributing specific information about this proposed change. Meetings will also be held in each district to receive comments and suggestions as well as to address any questions you may have in preparation for the final proposal to be presented on January 28. 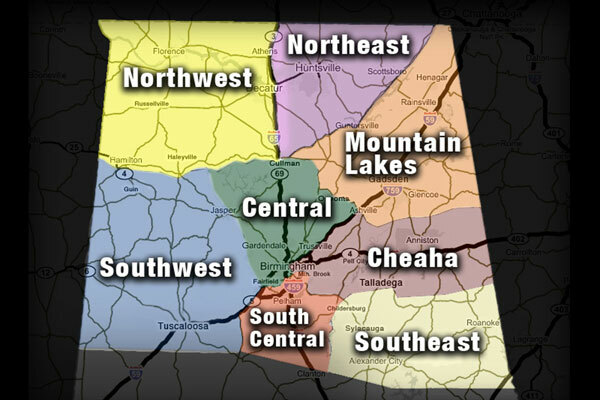 We recommend that the number of districts within the bounds of the North Alabama Annual Conference of the United Methodist Church be reduced to eight districts by the 2007 regular session of the North Alabama Annual Conference. Report these new boundaries to the annual conference as soon as possible via the North Alabama Annual Conference website. We recommend that the District Study team remain organized to consult with the bishop and cabinet for the next five years in making adjustments to the district lines as needed. We further recommend that a transition team be nominated and elected at the special session to assist with all the legal, financial, and property matters related to reducing the number of districts. Download a printable PDF of the District Study Team's recommendation to the North Alabama Conference. The informational pamphlet mailed in response to the questions and comments heard at the December District Meetings. "Rationale for Redistricting/Restructuring/Refocusing Ministry in the North Alabama Conference"
This is a supporting document to the Rationale Document above. The discussion of realigning districts in North Alabama is not a new one. Here is a PDF copy of a 1970 study on the topic "A Plan for Redistricting in North Alabama Annual Conference"
This two page document gives an overview of the Districts of the North Alabama Conference throughout its history.